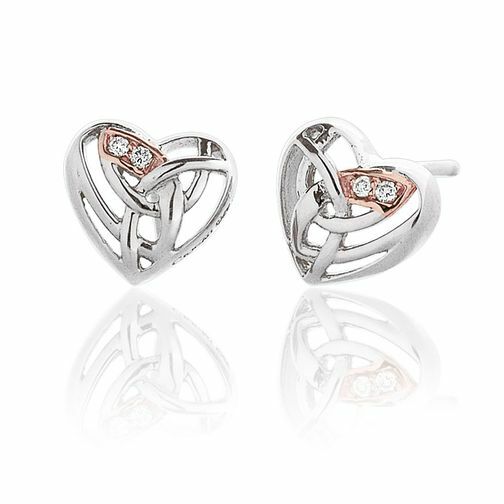 An elegant and romantic pair of Eternal Love stud earrings, crafted in sterling silver and 9ct rose gold and set with glittering diamonds for a luxurious finishing touch. All Clogau Welsh jewellery contains a touch of gold mined from the Clogau St David's gold mine - the very same gold used in generations of royal jewellery. Elegant jewellery made with precious Welsh Clogau gold. Clogau Gold Eternal Love silver & 9ct rose gold earrings is rated 5.0 out of 5 by 1. Rated 5 out of 5 by Anonymous from Beautiful earrings These are lovely, well crafted earrings that made a beautiful present.